A pretrial order from the California courts has set the dates for the forthcoming trial between Oracle and Google over the rights and wrongs of Java’s intellectual property rights. 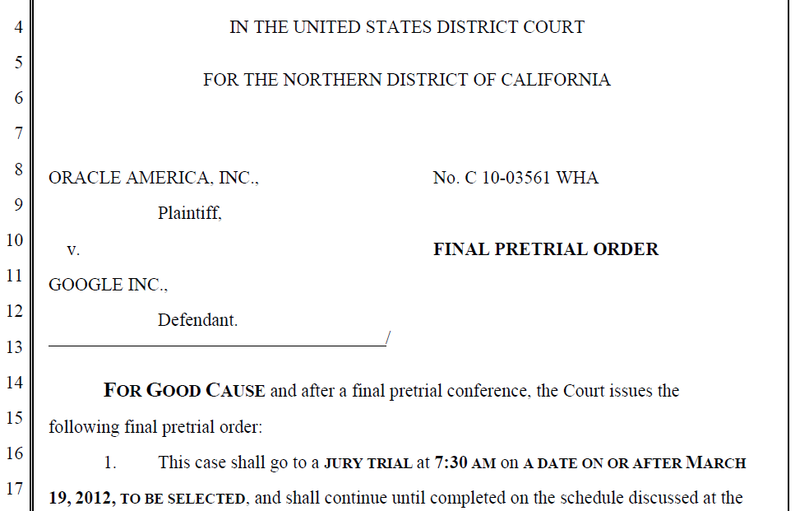 The trial will commence on or after 19 March, according to court documents, and will be split into three sessions: copyright infringement liability, patent infringement liability, and then damages and “remaining issues.” Judge William Alsup filed the orders, saying that the statements by witnesses should not be recorded and witnesses will not be allowed multiple visits to the stand. Oracle had been hoping for an early trial but the date gives Google considerable time to marshal its defenses. Larry Ellison is known to favor a blitzkrieg attack on legal issues and the extra time, and the trial format, could give Google an advantage.